I don’t read my emails. I mean, I read some of them but clearly not all of them or this wouldn’t happen. And when you don’t read your email you miss out on things. I recently deleted an invitation to speak at a conference in Australia. Thankfully the organizers contacted me on a social network as well so we may be able to make it work. I have no idea how many opportunities I’m missing. 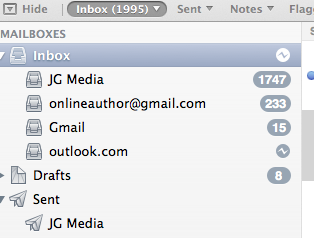 So now I’m trying to get my inbox down to a reasonable number 1,747 are too many unread emails on a business account. When someone sends me an email that’s obviously useless I do a search for them and try to delete all their emails. This is what happens. This local to Los Angeles publicist has been emailing me for years. In August I responded to her and asked her to take me off her list. That clearly didn’t work well. She’s not the only person who abuses my inbox but then I got to looking at her particular client list and I saw small businesses and authors and my heart hurt for them. How much do you think this publicist is collecting from them? Have you ever been tempted to call the business owner on the phone and say, “You seem like a hardworking person with a great business and you’re being duped.”? Of course I don’t do this because everyone knows you shoot the messenger. It’s just shocking to me that we’re still having this conversation.